Click to play, use the arrow buttons to jump to the next or previous track. Some of the memories of my wonderful childhood in Popondetta, New Guinea. A remake of the old hymn which was sung the night I gave my heart to the Lord as a 16 year old. “One cannot surrender a life in an instant. That which is lifelong can only be surrendered in a lifetime.” – Jim Elliott. An uptempo song that deals with the need for us to search and examine our hearts …and the need for a real heart revival. Track 5. You Did It for Me. Based around Matthew 25… an encouragement that even a cup of cold water given in His name will not go unnoticed….that whatever we do should be done for love of Him. The true story of a father and his daughter, set in the highlands of Scotland in the 1800′s. This is a real picture of the Father’s unchanging love for each one of us, regardless of what we have done. Track 7. Hay, Wood and Stubble. While I was living in Borneo, a nearby longhouse was burnt to the ground one night. When I went there the next day and saw the place in ashes, I was graphically reminded of the day when ‘The fire will test the quality of each man’s work.’ (1 Cor 3v13) Will it be gold, silver, precious stones, or wood, hay and stubble? Track 8. Devil Dressed in White. This song was inspired by the life and loves of Catherine Booth…her love for God; her love for William, her husband; her eight children; sinners; and the church. At her death, her full and influential life was summed up in just two wonderful words for her epitaph – She loved. 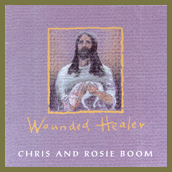 I wrote this song at Easter time after seeing a book my sister in law was reading called Wounded Healers, which told how those who have experienced pain and suffering themselves are best qualified to bring healing to others. And immediately I thought of Jesus Christ, our wounded Healer. ‘For He was wounded for our transgressions, bruised for our iniquities.’ Isaiah 53. Written as a segue to Wounded Healer, it points us to Jesus, the lamb of God who takes away our sins. At times I was moved to tears, at times moved to worship. Thank you.’ - China. ‘My heart is filled with gladness and joy from hearing these meaningful songs.’ - India. ‘I wept all the way through Wounded Healer. Thank you so much. They were healing tears.’ - New Zealand. You can buy this album here – no account required!